Primaforce Alcalean is a dietary supplement, in the composition of which there is Acetyl-L-carnitine. It is a modified and biologically active form of the amino acid of L-carnitine. This change of form causes some differences in the mechanisms of activity, it widens the field of activity of the active substance and increases its nootropic potential. The preparation is conducive to strengthening cognitive abilities and improvement of sports efficiency. It is recommended to people burdened with excessive physical or intellectual effort. Supplementation has positive influence on the condition of the nervous system, especially in case of exposure to strong stress. The preparation may also facilitate the work of body definition: it demonstrates high anabolic potential and the ability to reduce fatty tissue. Acetyl-L-Carnitine (ALCAR, ALC) is a derivative of amino acid L-carnitine and more precisely - its acetyl ester. This compound is classified to the group of pseudo-vitamins. It differs from a classic form of L-carnitine by stronger influence on the central nervous system and ease in crossing blood-brain barrier. It demonstrates neuroprotective and antioxidant properties, plays a role of a precursor in the synthesis of acetylcholine. Acetylcarnitine is one of very few compounds, which easily cross blood-brain barrier and quickly permeate nervous tissue. It is owed to its chemical structure and the presence of ethyl molecule. After reaching the brain, ALCAR promotes the synthesis of acetylcholine. It provides acetyl groups, which are essential for the production of this neurotransmitter. Acetylcholine is responsible for the pace of processing information and memory consolidation, therefore its effective production is reflected in memory improvement and better mental ability. Acetylcarnitine also contributes to increasing the level of serotonin, noradrenaline and dopamine. It may be potentially used to improve mood and alleviate depression. It is conducive to reducing the feeling of chronic fatigue and it works well in case of decreased motivation and lack of energy to act. Acetyl-L-carnitine provides desired effects regarding the hormonal system. It mainly influences the level of testosterone and the concentration of cortisol. It promotes the production of the former and reduces the excess of the latter, which has positive effect both on the body esthetics and mental well-being. The mechanism of its activity is related to the intensification of the secretion of the luteinizing hormone (LH), which is the main initiator of testosterone production. Additionally, ALCAR improves sensitivity of androgen receptors to the activity of testosterone. Regulation of cortisol concentration, in turn, is possible thanks to limiting the excessive activity of HPA axis (hypothalamic–pituitary–adrenal axis). Supplementation with the preparations with acetylcarnitine is a valuable element of prophylaxis of neurodegenerative diseases. It was proven in the course of research that ALCAR decreases oxidative stress and inhibits excitotoxicity in the brain tissue. It prevents death of nerve cells and neuronal damages made by reactive oxygen species and heavy metals. Acetylcarnitine may also support the work of heart. It protects from decreasing the level of cardiolipin, which by its participation in the respiratory chain conditions proper work of cells of the heart muscle. Moreover, ALCAR supports the condition of blood vessels and is conducive to regulating blood pressure. By supporting metabolism of fatty acids and improving sensitivity of cells to insulin Acetyl-L-Carnitine prevents obesity and decreases the risk of developing coronary heart diseases, atherosclerosis and heart attack. Acetylcarnitine has an established place in sports supplementation. It works well especially in long-lasting and intensive effort, which depletes physical and mental strength (combat sports, endurance workouts). One of the basic activities of Acetyl-L-carnitine is the improvement of the effectiveness of transport of lipids and fatty acids to mitochondria. It also helps to reduce adipose tissue and increase energy production in the organism. Utilization of fat for energy needs also allows to save glycogen stored in muscles. 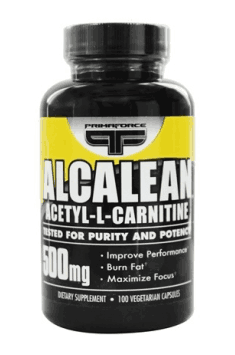 By facilitating testosterone production and inhibiting overproduction of cortisol, ALCAR is conducive to increasing muscle mass and facilitates the work of body definition. It was proven in the research that Acetyl-L-Carnitine decreases the presence of biomarkers which indicate muscle tissue damage after intensive physical effort. It may then be concluded that supplementation will be reflected in better regeneration and smaller post-workout fatigue. To sum up, Primaforce Alcalean is a supplement, which may have both pro-health and pro-cognitive application. Additionally, it shortens the way to achieve a dreamed silhouette. It works equally well in physically active people as well as those who constantly need maximal intellectual efficiency. As a dietary supplement, take 2 capsules twice a day with meals. According to the recommendations of the producer, the preparation should be taken twice a day. It is best to take the first dose on an empty stomach and the second - 45-60 minutes before training or the last meal. In this way, supplementation will most effectively contribute to increasing endurance, strength, better post-workout recovery and reduction of mental and physical fatigue. Acetylcarnitine, as a precursor of acetylcholine, increases its level in the organism. The preparation may be also combined with a supplement containing lecithin, which is the main source of choline, also used for the synthesis of acetylcholine. Primaforce is a company offering a large selection of diet supplements and sports nutrients. In their product range there are supplements like pure creatine Acetyl L-carnityne, D-aspartic acid and taurine. The company also provides supplements stimulating the production of serotonin, supplements containing glucosamine, arginine and amino-acid products. Cellulose, magnesium stearate, silicon dioxide, titanium dioxide.